Since the last open call was a success, we’re sending out another one! This month’s Café Chercher is on the broad theme of “re-interpretations”. Do you think you have an interesting project to share? Is your project still in process and connected to art and research? Then Café Chercher might be a perfect place for you! Want to know more? Read this page and our website, or read the article in Metropolis M by Nim Goede about Café Chercher #4.1. 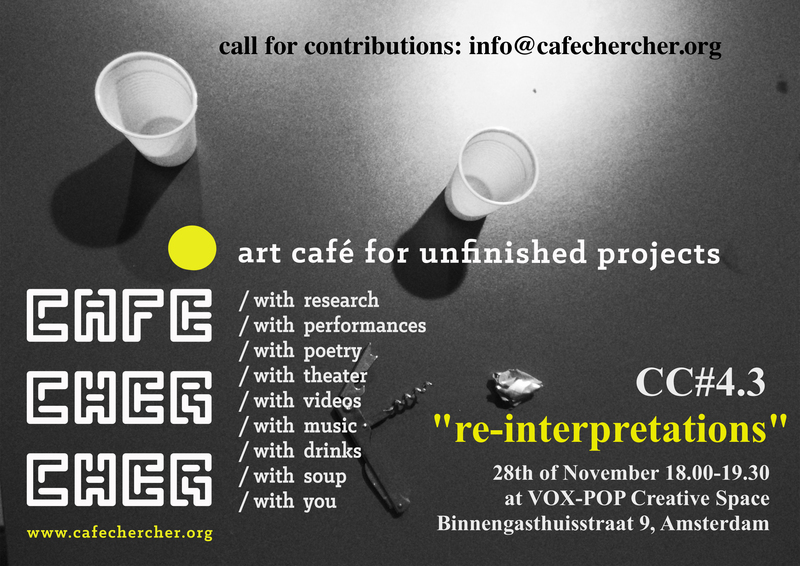 Café Chercher is a platform to present unfinished research projects. These projects typically exist between the realms of the arts and the sciences: artists involved in research and researchers involved in the arts. Every last Tuesday of the month we organize evenings with presentations, with performances, with music, with videos, with soup and with drinks. Participants are practitioners, students, PhD-researchers, and professors from different disciplines and institutions. They are not only artists, musicians and art historians, but also biologists, gamers and neuroscientists. Everyone with an interesting unfinished research project is welcome to participate! We provide an informal and intimate atmosphere with room for doubt and discussion. The contribution is based on research questions, on doubts, on hypotheses. These can be small or big questions. The contribution can be in a variety of forms like workshops, performative lectures, participatory happenings, or a powerpoint presentation. The contribution is based on unfinished artworks, prototypes, or try-outs. The contribution can be in a variety of forms like artwork, performance, video, music, dance, theatre, poetry, preferably not a powerpoint presentation.